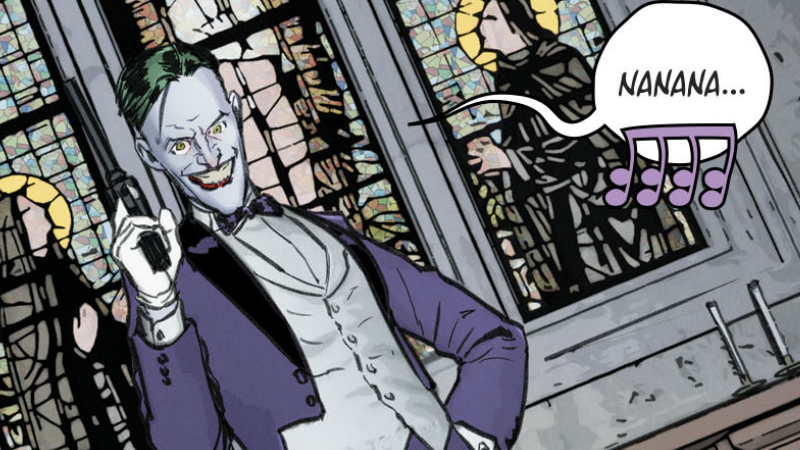 The Joker ponders a familiar tune in Batman #48. Please, try to be shocked: it’s called Joker. And it’s hitting theaters next October. Just as San Diego Comic-Con gets underway, Warner Bros. and DC Entertainment have officially confirmed that their Joaquin Phoenix-starring Joker film will release October 4, 2019, as reported by The Hollywood Reporter. The title is not a surprise in the slightest, of course—although it makes it interesting as to how the supposedly-in-the-works Jared Leto Joker film will be presented, a thought experiment born out of the fact that there are way too many Joker films in the works—but the fact that the film is due out in under a year and a half absolutely is. While we’ve been hearing about the film for a while now and all the associated casting drama with it, as far as we know it’s yet to actually enter production. And now, it’s actually hitting theaters in time for Halloween 2019. That is, if it keeps that release date! Will we see Joker material at Warner Bros.’ Comic-Con panel this Saturday? Who can say—but if it really is just 15 months away, maybe there’s a chance?